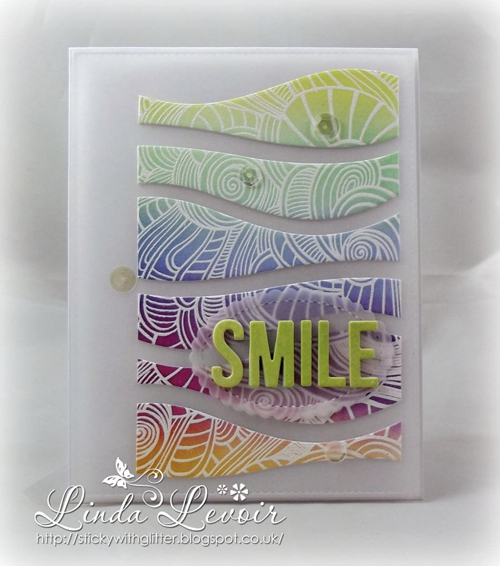 Linda's inventive use of the Snow Drifts Cover-Up features a stunning color gradient and a pattern created with the Wavy Coloring Book Background. 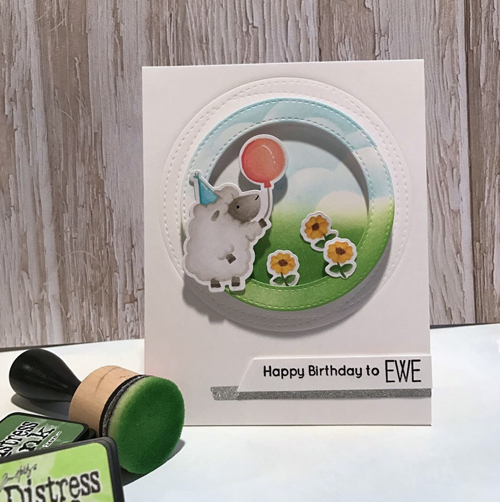 A layer of vellum is a great way to soften a bright background and provide a spot for your greeting! 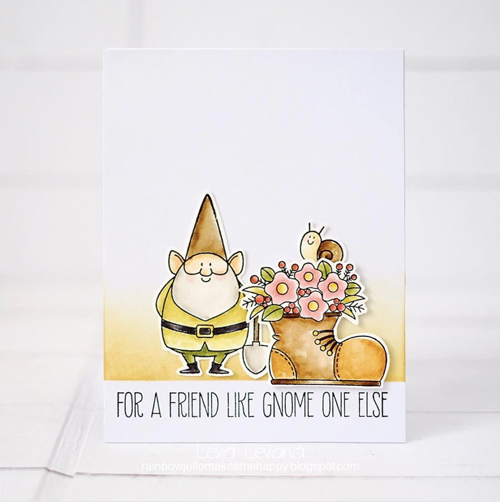 You Gnome Me is a Birdie Brown favorite and the perfect set to grab if you're yearning for spring. Lexa's gnome is accompanied by a flower-filled boot, an adorable little snail, and a simple but extremely effective blended color element that grounds her scene. Such a cute clean & simple look from Vanessa! 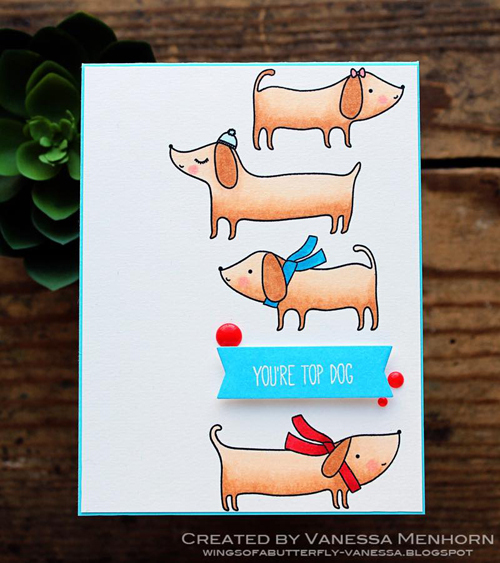 Top Dog includes six sweet pups, four of which are included here. Positioning everything on a stark white background makes those pops of red and blue act as simply perfect exclamation points to the whole design. What I adore about Janelle's card is her framing. Her sweet sheep from Ewe Are the Best sits perched upon a one of our Stitched Circle Frames. The real treat is how she carried the scenery beyond the background and extended it onto the frame - such a cool look! I'm so impressed by Kaja's use of color and her inventive use of the slider element. Penguins in Paradise sliding your way with a delicious drink - how fun! 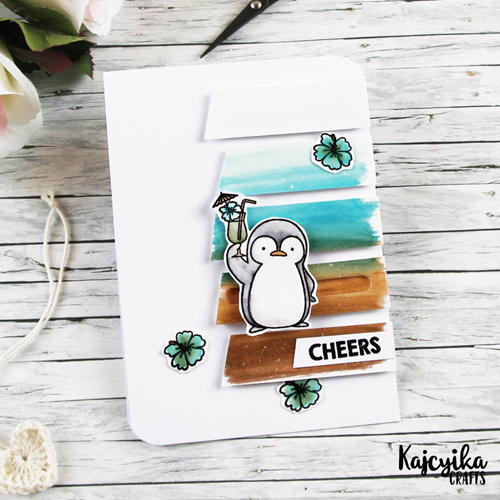 THREE of these fabulous projects were inspired by Sketch Challenge 320 - we love seeing how a sketch can be the impetus for inventive new looks. We'll see you tomorrow for another great Sketch Challenge, and don't forget to check out a brand new MFT Color Challenge on Thursday! Thank you so much for showing my card! I am honored to be mentioned here! Oh thank you sooo much for this honour! The other cards are just gorgeous!